My loves! How art thou? I am so excited about today's show and tell. Albertina from Mimosa Lane is obviously a daily read for me and has quickly become a close bloggy friend of mine for many reasons. 1. Her design ideas are genius. 2. I love her name. Seriously Albertina. 3. She loves monograms. 4. She is a beautiful person inside and out. I mean, need I say more? I completely idolize her aesthetic, and I know you will too. I cannot wait for her to show her space off! Go for it Albertina! Hi, I'm Albertina from Mimosa Lane. I'm thrilled that Lindsay asked me to contribute to her 'My Favorite Room' series. I love Lindsay, her blog, and her fabulous sense of humor and voice. S+S is a daily must read for me (as in one of the few blogs I have to read before I leave the house before 7:15!). Here is a close-up of my desk chair. I I love the font of the initials. My friend Karen helped with this one. She found the font and made it happen. In front of the bed I have a beautiful mirrored chest where I keep all my baubles (I have a serious addiction to necklaces and earrings). I made that acrylic painting myself! What do you think? too wild? It is really growing on me. These two slipper chairs are from Crate and Barrel reupholstered in Clarence House fabric. YUM!!! The fabric is amazingly soft. I love my little candle sconces in the middle. I also have this chaise from Crate and Barrel in the corner. Its awesome to read in and layout clothes when going on a trip. The pillow is from Alexandra Ferguson. I have another one of hers in my study. 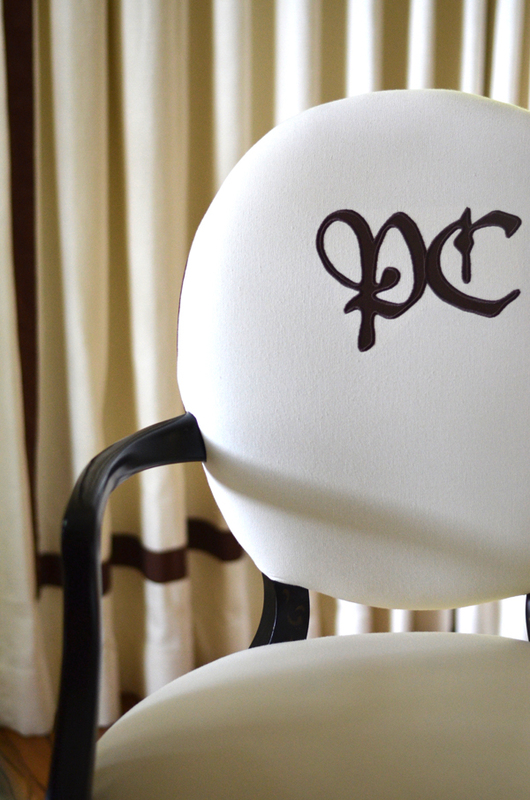 The small pillow with our initials was hand stitched by a friend of my mom's for our wedding. It is the one the ring bearer took down the isle, so ofcourse it is a prized possession. Well, there you have it- bits and pieces of my bedroom. Thank you Lindsay for having me! I'm honored. It's fantastic. How cool is that chair. I love the styling...it feels like home. 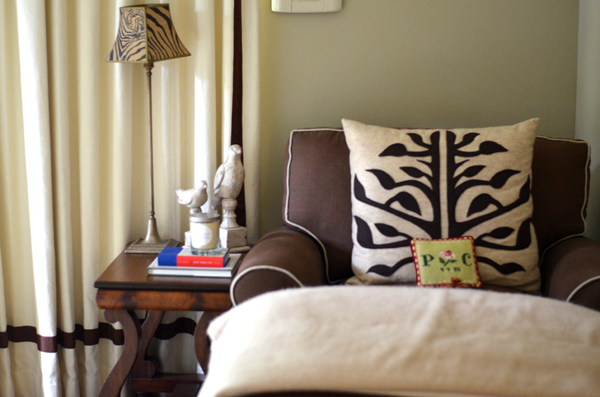 The fabric choices are wonderful - that Tree of Life on the headboard, yes! And the Clarence House on the slipper chairs! And don't even get me started with all the gold accents. Just lovely! 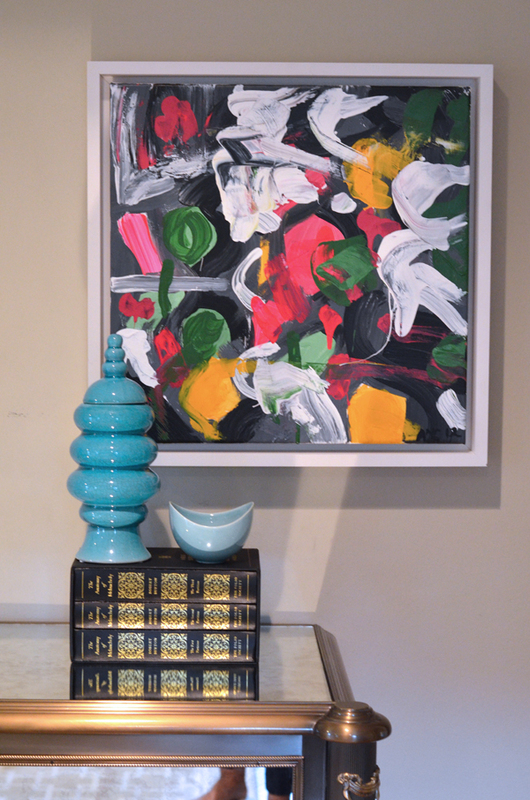 I love it, especially the night stand and the paintings in the room. Beautiful roon Albertina! Hello gorgeous- in love with those sconces and the headboard and the chairs...and well...all of it!!! Aww lady, that desk is the bees nees (as you would say!) love it. Great room with amazingly personal touches. The paintings are equally fab. No idea you had this hidden talent? Hello, an Etsy shop no? Oh gorgeous! I love the mix of colors, patterns and textures. 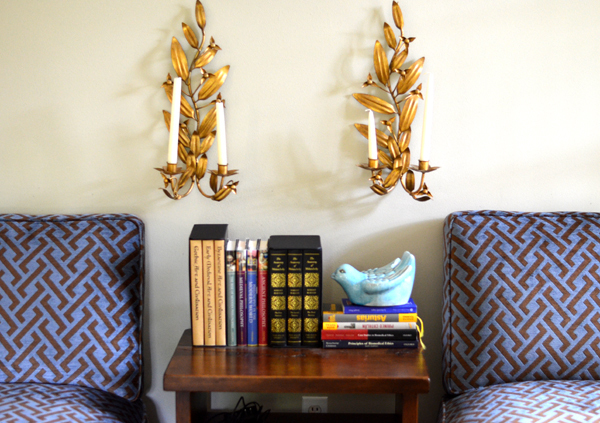 And can we talk about those sconces??? Lawzzzy lawzzzy, so gorge! Gorgeous!! No detail goes unnoticed! Great eye. Love Mimosa Lane... and this master bedroom is absolutely stunning! Love the fabrics and colors... gorgeous! Beautiful style! I love the artwork, it's so colorful and fun. Very nice. 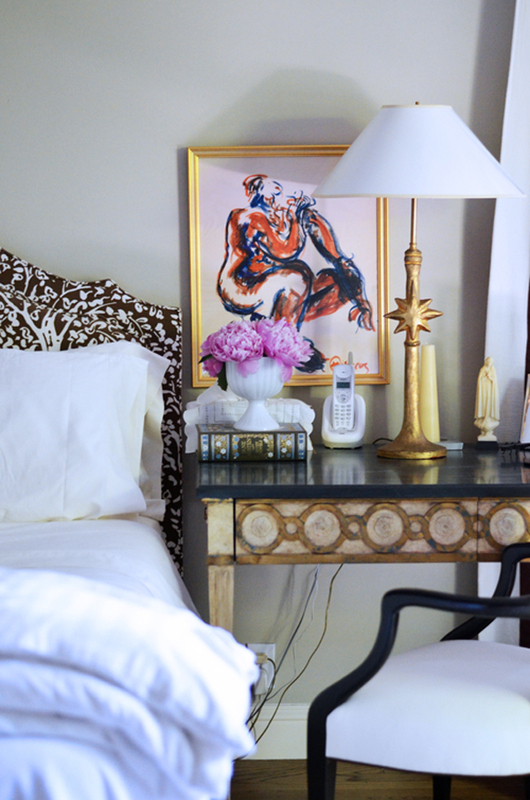 Really love the bedside table and artwork. Mimosa Lane is one of my daily read and it's true, Albertina is really an amazing woman!